We warmly welcome you to the Womanhood Studio. We are a community based studio, providing a special and memorable experience for women, men and children of all ages. What’s more our studio is formed by a strong community of women. Our teachers are highly motivated, creative and passionate people who not only love what they do, but also love sharing it with you. At Womanhood Studio you will find a wide variety of activities for your whole family. We aim to keep you moving, both physically and mentally! 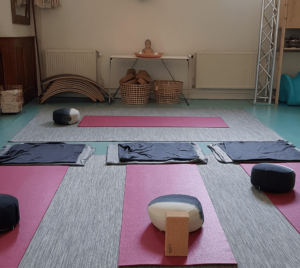 EVERYONE is welcome to our studio, from new-born babies in our post-natal classes, to their parents as well as grandparents in our different Yoga and Pilates classes and workshops. Men and women, young and old, at any age can join! In our lovely historic and characteristic studio in the heart of Delft we offer both group and private classes. We keep our groups relatively small. To us it is important that we have enough time to give you the attention you deserve. We are grateful to have you spend time at our studio, so we strive to make our classes and workshops a special and unique experience. We want you to feel comfortable and we hope you will grow to love the studio, as much as we do. On our schedule you will find many different group classes, from Pilates, Yogalates to Aerial Yoga and a variety of Yoga classes . We also provide classes for starting families from Pregnancy Pilates to Post-natal healing movement classes, to Kid’s Yoga and Yoga & Play classes and so much more. Check out our schedule. Beyond our weekly class schedule, we also offer massages, private and custom made (group) classes . As an introduction to the classes you see on our regular schedule, we offer monthly beginners’ workshops. If you have always been curious about Yoga, Yoga Basics might be perfect for you. Or if you want to fly and play in our hammocks, come try the Aerial Yoga for Beginners workshops. Both are monthly returning workshops. Keep an eye on our event calendar to see upcoming events, or sign up for our newsletter to help us keep you informed! For expectant families we offer special services, from childbirth courses to pregnancy Pilates and Doula services. We will help you and your partner navigate through this extraordinary time in your life. In the post-partum period, both you and your baby are welcome to enjoy our post-natal healing class and baby massage workshops. From there on out there are many more classes that might fit you and your family. We would love to see you! Wishing you a healthy and happy day.